Pascal Martin has posted his latest summary of topics and conversations from August on the php.internals mailing list. I’ve been quite busy in August (and I’ve taken some holidays, during which I pretty much had no Internet access, which doesn’t help), and I haven’t been able to write my digest of internals@ for July 2014 in due time. Instead of writing it now and keeping getting late for August’s one, I’ve chosen to skip my digest of July - and to write August’s one, which you can read below. Check out the full post for the details on each of these and more of the happenings on the internals list during August. As anyone who subscribes to the php.internals mailing list knows, there can be a lot of drama around some of the discussions for the future of the language, both in its features and surrounding technical concerns. Daniel Cousineau has posted a lighter take on some of this drama and is issuing his own "RFC" for a proposed mascot for internals - the DramaLlama. Branding and PR is an increasingly important factor in programming language viability and adoption. Visible instability in the core team is off-putting to large organizations who depend on long term reliability and support and only encourages them to look to languages and tools with more stable and professional core teams. This RFC proposes that the PHP core team get ahead of the issue and introduce a logo, separate from the public facing project, to provide a sense of professionalism that is lacking. I humbly submit the DramaLlama as the superior candidate. 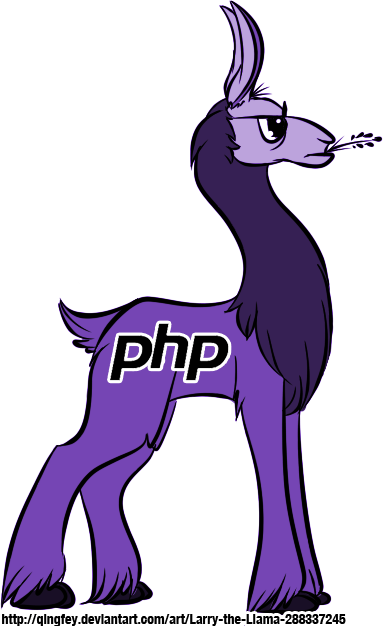 His proposed mascot, shown here, bears the PHP logo on the side of a cartoon purple llama. As Daniel puts it, the llama is a "proud, capable animal" that can deal with a lot and still stand up under a heavy burden. By not adopting a logo, the PHP core team risks losing the respect and trust of the end user community. However it could be argued that the core team has survived without this and could do so indefinitely. The post is practically dripping with sarcasm, but it's a good mood-lightener around some of the drama that can come from the clash of multiple personalities in the PHP internals community. Pascal Martin has posted a summary of the PHP internals mailing list discussions for the month of June. June 2014 came back down to a reasonable 493 messages on PHP’s internals@ mailing-list, after a month of May with more than 800 mails, including some long discussions about phpng. ...and many more. Check out the full summary for more discussions and links to several of the topics and resources involved. Anthony Ferrara has a new article posted to his site today about parameter typecasting and the discussions that have been happening about it on the PHP "internals" mailing list. As any of you who follow the PHP internals list know, scalar type hinting has been a hot topic as of late. You'll also know that I've submitted two new RFC (Request For Comment) proposals for inclusion of two new major features in the PHP language. I figured it was worth going into both RFCs and patches a little deeper, explain my rationale and (hopefully) garner some more visibility of the proposals. He shares the details of the two main RFCs that are proposed right now - parameter type casting hints and object scalar casting magic methods (both with code examples). Right now, they're only in the patch stage and there's talk of improving the current casting functionality of PHP before something like one of these goes into place. On the Symfony blog Fabien Potencier has a new post talking about a change in the support structure for developers wanting to get help with either Symfony1 or Symfony2 - a split in the mailing list to help make things a bit easier to split out. Now that Symfony2 is just around the corner, we need to better organize community support for both symfony1 and Symfony2. As more people start using Symfony2, the user mailing-list is becoming more and more difficult to follow. [...] After an opinionated discussion on the mailing-list, I've decided to create two new mailing-lists that are replacing the current users mailing-list: one for symfony1 and another one for Symfony2. The current mailing-list has been switched to the archive mode; all messages will remain browseable and searchable but new messages will be rejected. If you're a current member of the "users" mailing list and want a similar experience, you'll need to subscribe to both. Otherwise, pick the one you like and watch your inbox fill up. This break up makes it easier for people to find messages specifically related to their version of choice without having to look for the "[Symfony2]" tag in the subject line. Freek Lijten has a recent post looking at some of the types of discussions that happen on the php-internals mailing list. The internals list is the place to be to hear about the current state of PHP. It is one of PHP's many mailing lists, but this is the one where (core) developers discuss new features, current bugs and wild ideas. If you want to keep up with things it is a good idea to sign up, it is not an extremely high volume list and if you ignore the noise it is quite informative. In this article I would like to share examples of stuff typically discussed on the list. He mentions feature requests in general and, more specifically things like traits support (multiple inheritance), array dereferencing, callable arrays and the debate over the short array syntax. This is a quick how to, for people interested in adding subscribers to their Campaign Monitor lists. What you'll need: PHP 5 with SOAP built in, a Valid Campaign Monitor Account, a Campaign Monitor list. His simple script (about 10 lines with comments removed) makes a call to the service's API and passes in your key, a list and client ID and a call to the AddSubscriber method to push the new contact into the list. As Lukas Smith mentions, the latest alpha release for the PHP 5.3 series has been released - PHP 5.3alpha2. Wow, after what feels like ages PHP 5.3.0alpha3 was just released. Originally we hoped to be able to release now intermediate releases every 2-3 weeks, this one took a good 2 months. Somehow this releases did its very best to stall itself. People that needed to work on things together by chance ended up being busy with other things and vacations in just the right order to make things impossible. Most of this was to be attributed to the namespace discussions, which climaxed in the backslash FUD campaign. He notes that a stable release is probably looking good in Q1 of 2009 (with namespaces being the delaying factor). He also suggests something that could help make things a bit simpler in the future - making the internals@ mailing list read-only for anyone outside of core developers. A good bit of the confusion and bickering came from those outside the dev team and it didn't help the group come to a decision any earlier. You can find the official release information for the alpha2 on the main PHP.net website. Ben Ramsey has a new blog post that mentions a move for the PHP User Group mailing list - putting it official on the php.net services. You may recall PHP Groups being created over a year ago for the purpose of networking together the leaders and organizers of PHP user groups around the world. I've been very bad about keeping things moving on this front, but I want to pick things back up and get us talking again. If you'd like to subscribe to the list, send an email to ug-admins-subscribe [at] lists.php.net. If you don't want to subscribe but still want to keep track of what's happening, point your news reader to news://news.php.net/ug.admins. Lukas Smith has posted a quick emPHPower update to his blog today concerning recent thoughts and progress he's made on the initiative. I hope this all will lead to a few people to step up and really start getting involved deeply in emPHPower. Aside from this Sebastian has handed in a BOF session on emPHPower for OSCON. I hope this one will work out. A spot has also been set aside at the upcoming Zend/PHP Conference & Expo's unconference for someone to speak on the subject and to get a feel for things from the business perspective. Lukas has also been working up more details about the effort and has set up a mailing list to help with collaboration.